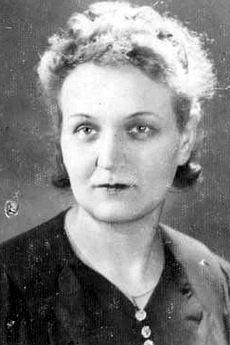 On this date in 1945 in Berlin, a German woman named Charlotte Rebhun was executed by the Nazis. She had almost made it through the war: Berlin fell to the Russians the very next day. Charlotte, a Gentile, had been married to Max Rebhun, a Jew. They had two children: Wolfgang, born in 1927, and Adele, born in 1930. Following Kristallnacht, Max was deported to Poland. Charlotte and the children followed him in 1939, and after war broke out the entire family wound up in the Warsaw Ghetto. On August 20, 1942, during the Grossaktion that ultimately resulted in a quarter-million deaths, Max was taken to Treblinka and gassed. His wife and children escaped the ghetto and set up residence in the Aryan sector of the city. Charlotte Rebhun (top); Charlotte with the infant Barbara (bottom). Already at considerable risk, Charlotte placed herself in further danger by hiding eight additional Jewish people in her apartment. In early 1943, a young Jewish couple in the Warsaw Ghetto, anxious to protect their nine- month-old daughter, convinced a German soldier (!) to smuggle her out of the ghetto. He gave the baby to his girlfriend, who passed her on to Charlotte Rebhun. The baby was named Barbara and called Bashka. The infant’s parents thought they would only need to be separated for a short time, and promised to come back soon to collect her. But they never did. 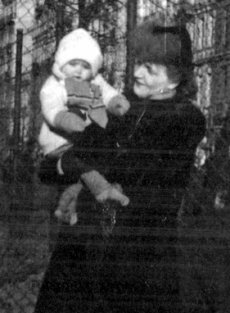 Charlotte treated Bashka as her own and kept her for about eighteen months, until the Warsaw Uprising in August 1944. With the Red Army approaching, the population of Warsaw decided to liberate themselves, and launched a rebellion against the Nazi occupiers. They were able to take the city back, but didn’t have sufficient arms or fighters to keep it without help, and help never came. While the Soviets sat and watched at a discreet distance, the Nazis regrouped, went back to Warsaw and crushed the rebellion. More than 150,000 Polish civillians died and more than half the city’s buildings were destroyed in the aftermath of the failed uprising. Charlotte’s son Wolfgang was one of the fighters who participated in the rebellion. He escaped summary execution, but was sent to the hellish Mauthausen Concentration Camp. Charlotte and her daughter Adele were sent to a slave labor camp in the city of Czestochowa. Little Bashka, who was two and a half years old, somehow got separated from her foster family. A Red Cross worker found her all alone in a little Polish town twenty kilometers outside of Warsaw. Barbara was taken in by a Polish family named Kaczmarek, who raised her alongside their five children for the next several years. After the war, the Jewish Central Committee in Warsaw initiated a search-and-recovery effort for child Holocaust survivors living with Gentile families. The Kaczmarek family wanted to legally adopt Barbara, and in 1948 the wrote to the JCC to ask if anyone in her biological family had survived. In response, the JCC sent someone to their to their house and removed Barbara by force. Sent to a Jewish orphanage, she was adopted by a Jewish couple and in 1950, they moved to Israel. It wasn’t until she was sixteen years old that Barbara learned she was adopted, and it wasn’t until 1996 that she began seeking out her roots. She was able to reconnect with the Kaczmarek children (the parents had died in the years since the war) and then Charlotte’s children, both of whom survived the camps. It was only then that she learned her rescuer’s fate: Charlotte and Adele had been liberated from the labor camp in Czestochowa and gone home to Berlin, but after their arrival Charlotte was executed. Just what “crime” she had committed to deserve her fate has not been recorded. 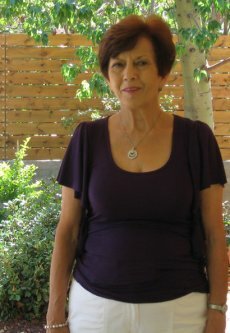 The adult Barbara, now known as Pnina Gutman. Unfortunately, Barbara (who now calls herself Pnina Gutman) has never been able to identify her biological parents. Adele and Wolfgang didn’t remember their names. Barbara had come to the Rebhuns with a note giving her name as Barbara Wenglinski, but that may not have been her real family name. The note had asked their daughter’s rescuers to contact their relatives in America if her parents didn’t survive the war and come back for her. Barbara wrote letters to seventy people in America named Wenglinski, but none of them provided any useful information. She would still like to learn who her parents were and what happened to them, and has appealed for information over the internet. Barbara’s mother and father are presumed to have perished, probably during the Warsaw Ghetto Uprising in the spring of 1943. Barbara would not have survived either were it not for the courage of Charlotte Rebhun and the others. Yad Vashem honored Charlotte as Righteous Among the Nations on November 20, 1997, more than fifty years after her death.